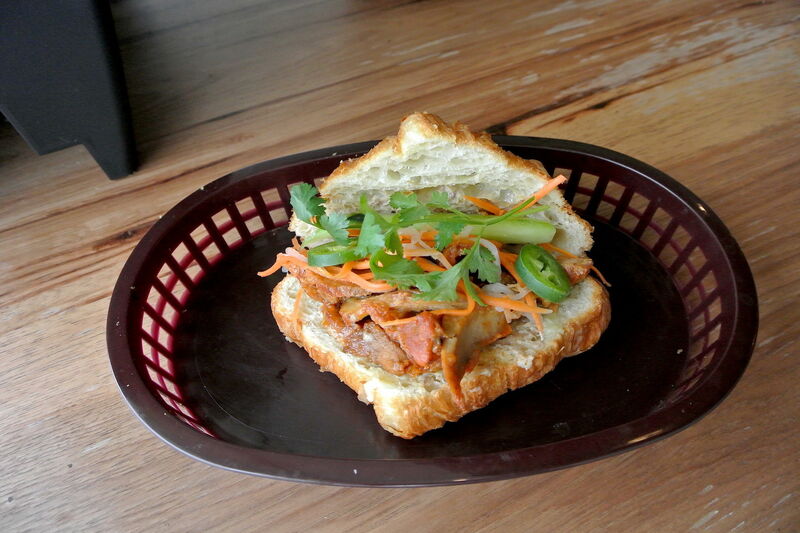 Banh mi thit chay—banh mi with vegetarian ham and pâté. 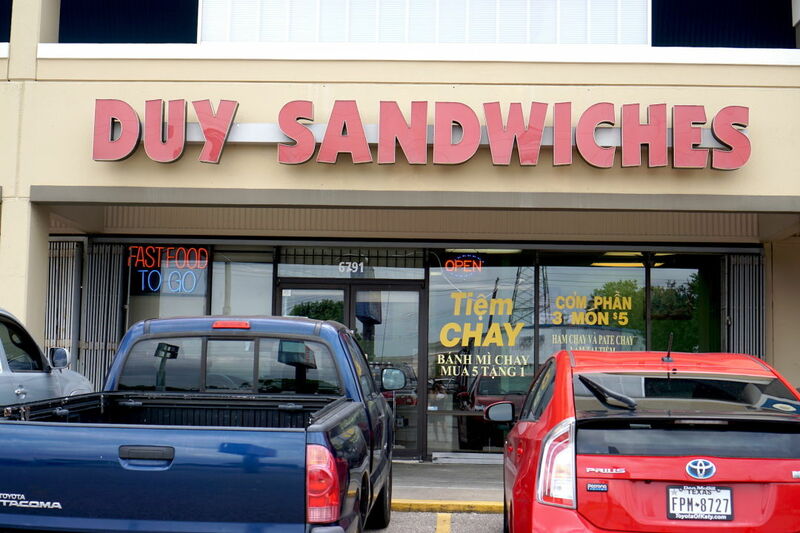 Located on the side of a strip mall at the corner of Wilcrest Drive and Bellaire Boulevard, Duy Sandwiches is so nondescript that it’s easy to miss. I’ve driven right past it on countless occasions. My mechanic is down the street, as is my go-to (up until this point, anyway) Vietnamese vegetarian spot, San San Tofu. Both require a drive by Duy Sandwiches, which I’d seen, but never thought to give a try until my Thai massage therapist told me to go. She was insistent, in fact. “I eat almost every day. 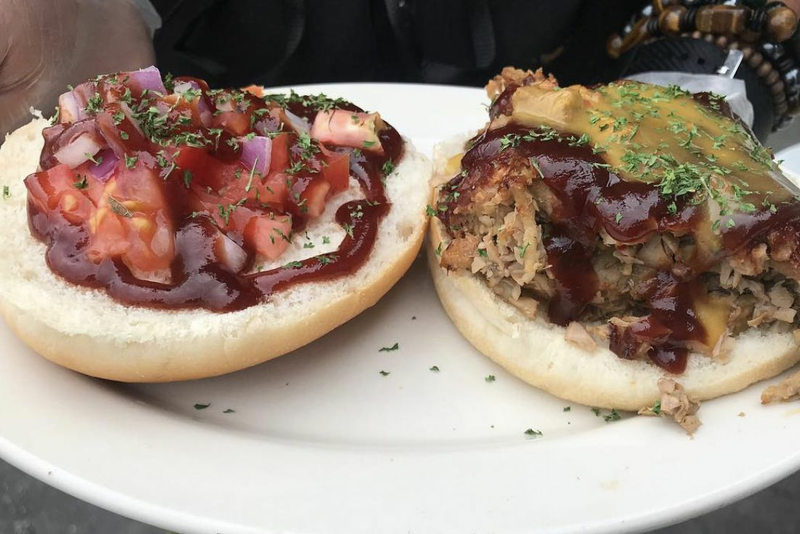 The food is delicious. You have to go!” she raved. 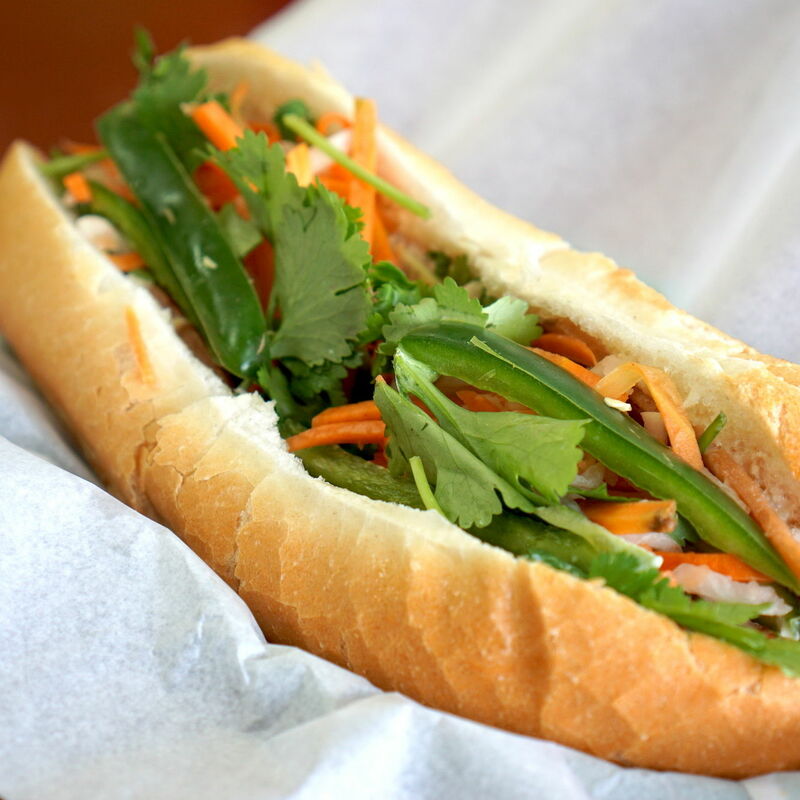 Duy Sandwiches serves fast-casual Vietnamese vegetarian cuisine. 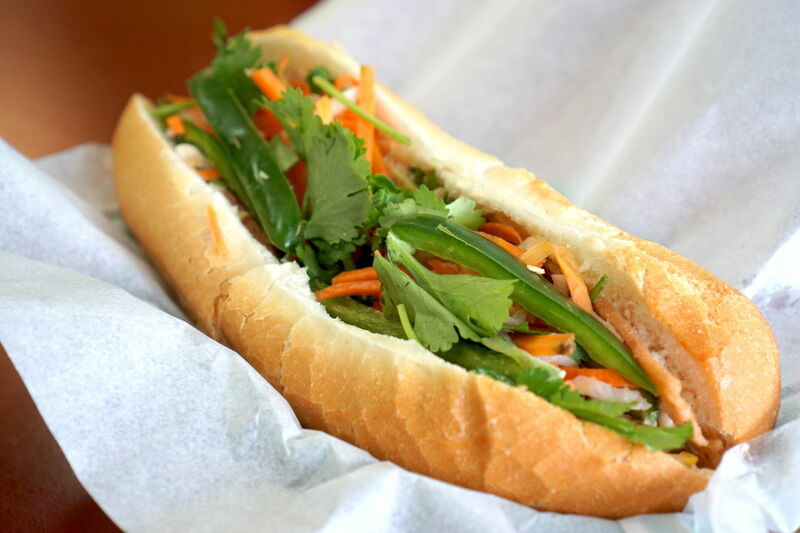 Their specialty, as indicated by their name, are Vietnamese sandwiches, or bánh mì. And rightly so. Their No. 1 special? 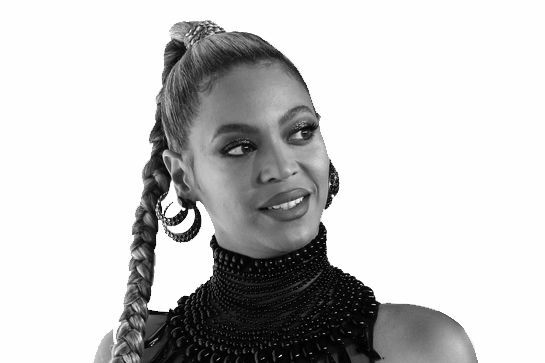 A revelation. Just-toasted bread; crisp, sweet and tangy pickled veggies; spicy fresh jalapeño; and cilantro combine with thin slices of faux-Vietnamese pork roll, made of soy bean, corn, carrots and peas, are assembled in seemingly perfect proportion, producing bite after bite of tasty, so-good-you-wouldn’t-believe-it-was-vegan banh mi. There’s a full menu of other vegetarian delights as well, typical Vietnamese rice and noodle dishes reimagined in vegan or vegetarian form. I ordered a very good vegan bún riêu, Duy’s version of tomato and crab vermicelli soup, wherein the crab had been substituted with tofu-like slabs of protein. Its taste was more obviously meat-free, but it was presented beautifully with a side plate of purple cabbage, lime wedges and herbs. 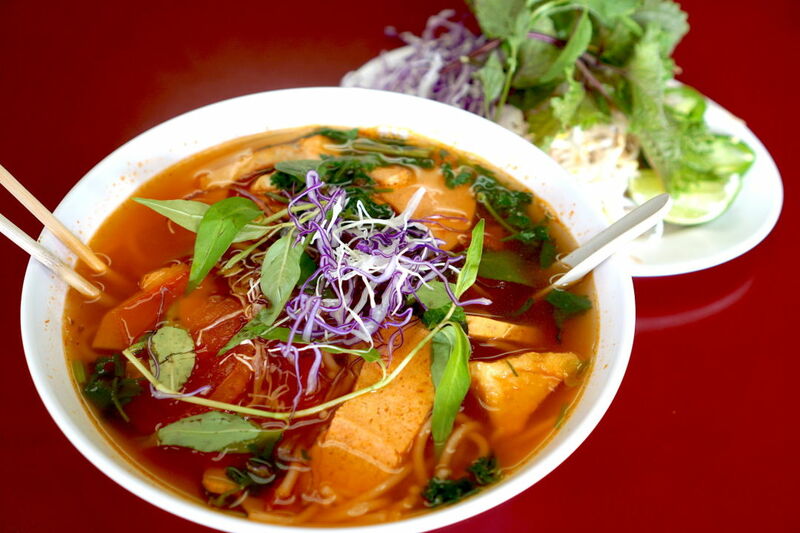 Vegetarian bun rieu—tomato-and-tofu vermicelli soup. A vegetarian cà ri chay, or vegetarian curry, was also excellent and inexpensive, though on the sweet side for my taste. For $7, I got a hearty bowl of curry chock-full of carrots, faux chicken and potato with a roll of french bread (you can also order it with rice or noodles). 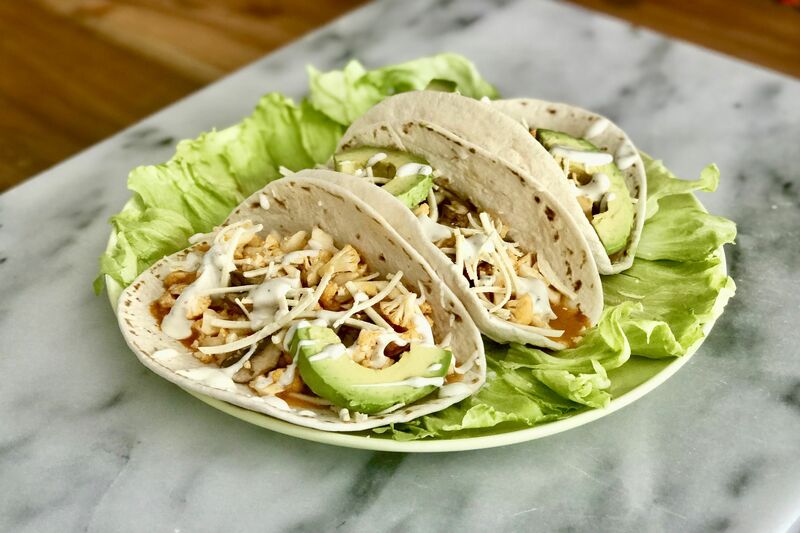 Reminiscent of a Thai yellow curry, with a fragrant coconut base, the portion was generous enough for me to split into two meals. 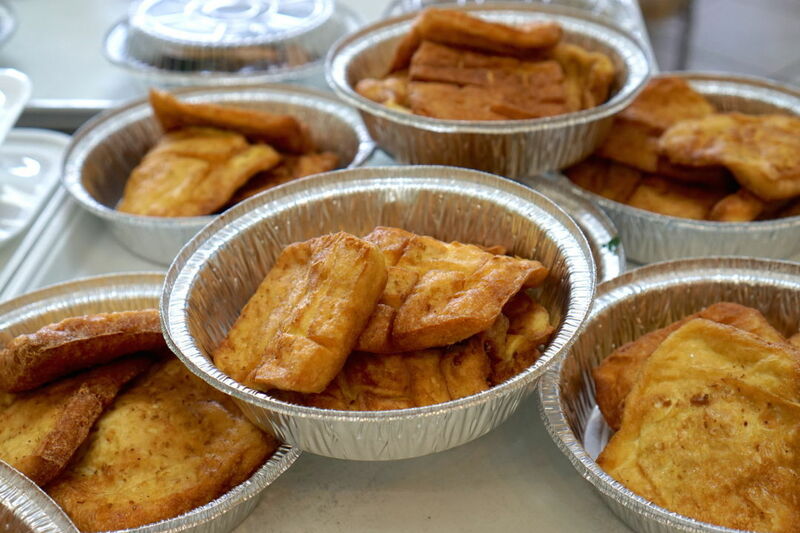 Like other Vietnamese bánh mì shops around town, Duy Sandwiches sells an assortment of grab-and-go cakes and snacks. What sets the apart is the huge table in the center of the room stacked with a selection of round to-go boxes filled with single-item stir fry dishes. I took home a box of tofu with tomato stir fry for $5, cooking white rice at home for a modest, healthy, low-cost meal. Because I enjoyed everything so much, less than 24 hours later, I found myself back at Duy Sandwiches—this time to sample their lunch special of three hot plate items and rice. And the great thing about it? It set me back just $5, cash (they only take cash). The fact of the matter is, you can go to a fast food drive through these days and spend well over $5. It may be convenient and they may accept a credit card, but you won’t feel nearly as good as I did as I was digging into my simple, healthfully prepared tofu two ways and pickled mustard greens with rice. I look forward to repeating the experience soon. $ Vegan, Vegetarian, Vietnamese 6791 Wilcrest Dr.